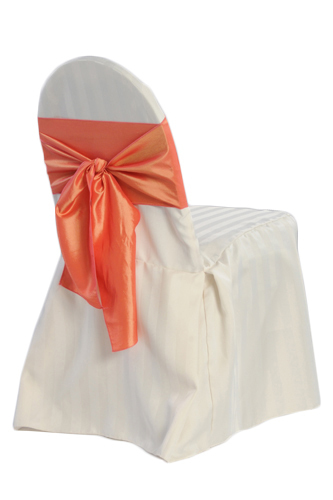 Banquet Satin Stripe Chair Cover Rental with FREE Sash Rental When Renting 50 or More Chair Covers - See Chair Sashes for Qualifying Free Sash Rental. Reduced rental pricing for all shipping orders when renting 50 or more chair covers. Our Banquet Satin Stripe Chair Cover Rentals are made of high quality polyester fabric and specially packed for shipping and transporting to minimize wrinkles. Select from white, ivory, or black. Back- Top to Seat - 19"; Seat to Floor - 16 1/2"
Front- Top to End of Seat - 36"; Seat to Floor - 16 1/2"
Back Top at Curve - 17 3/4"